Most Australians may very much still be in summer holiday mode, but over in Europe the January design fairs are already in full swing. 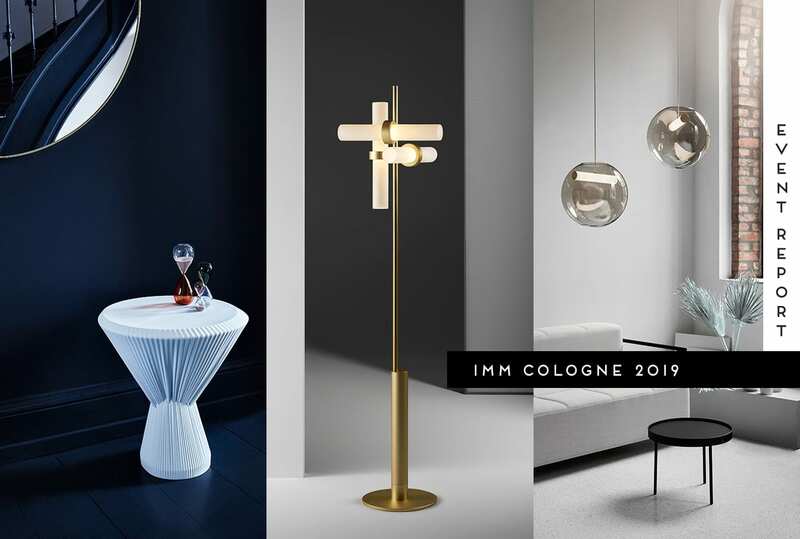 The first major show on the ticket, IMM Cologne 2019, has been and gone, closing out its 70th edition on January 20th. We have to give a proud shout-out to Rotterdam-based Aussie duo Truly Truly, who were appointed to create the “Das Haus – Interiors on Stage” installation this year. Founders Kate and Joel Booy brought their experimental vision of contemporary living to life. Communal living spaces were left ambiguous, encouraging visitors to question the nature of the traditional, delineated functions of a home. Allow us to take you through the rest of the highlights from the German fair, spanning the best new furniture, lighting, and home accessories you need to know about. Pure Talents Contest At IMM Cologne 2017. 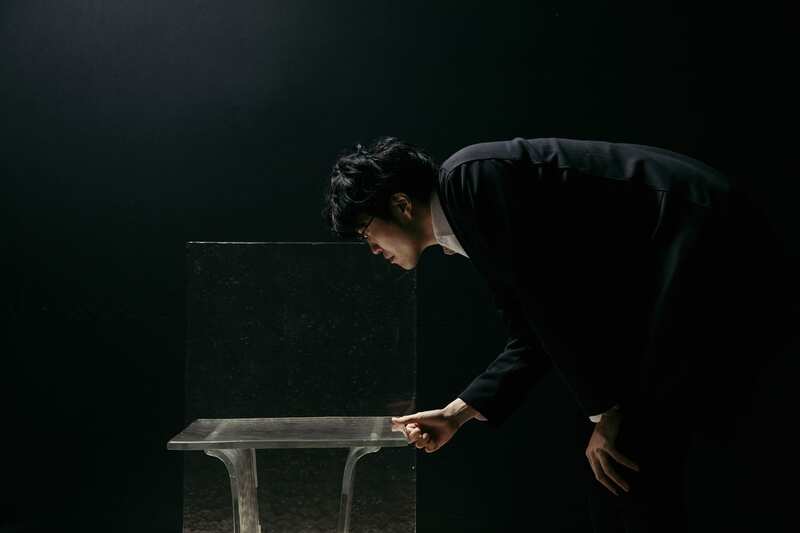 WonderGlass Melt Collection by Nendo // In collaboration with Nendo, WonderGlass’ latest furniture and tabletop collection Melt aims to push the boundaries and capabilities of cast glass. Watching craftspeople in the Wonderglass workshops work with molten, melted glass inspired Nendo designer Oki Sato. 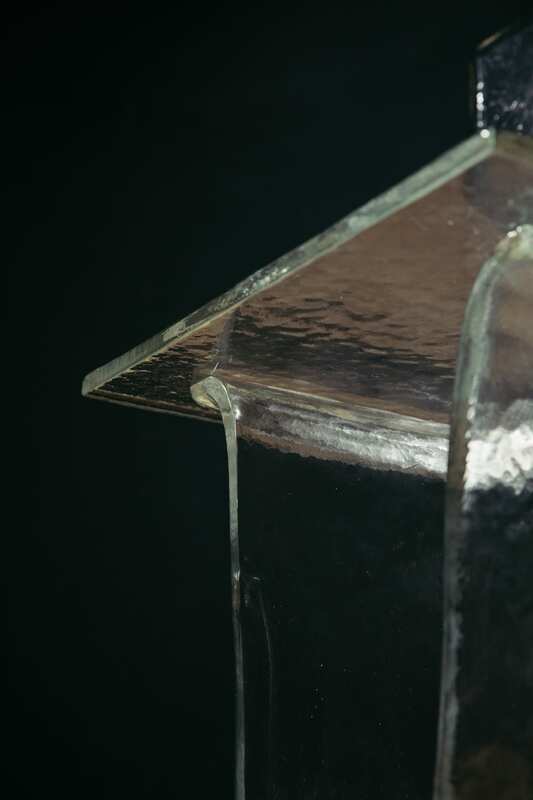 “The main idea was to let the glass flow by itself using gravity and using the weight of glass itself. In a way, doing less and achieving more is the most complicated thing to do,” says Sato. 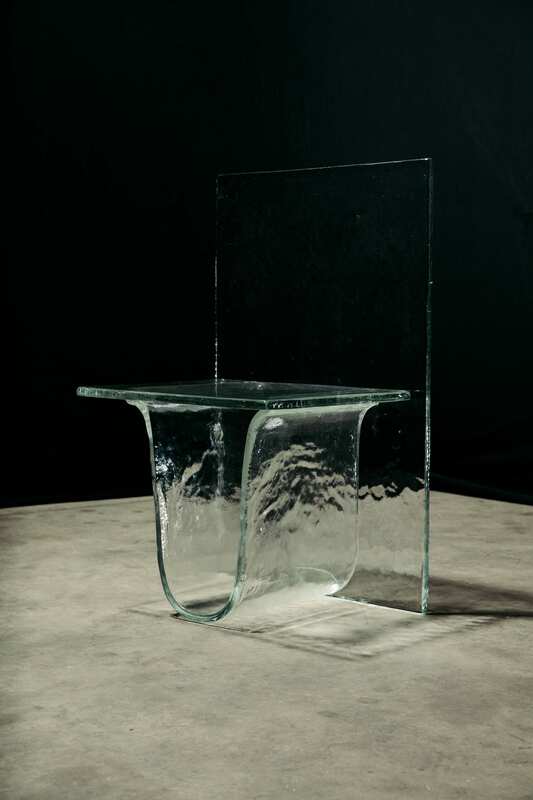 The exhibition is a preview of WonderGlass’ upcoming installation at Salone del Mobile in April. 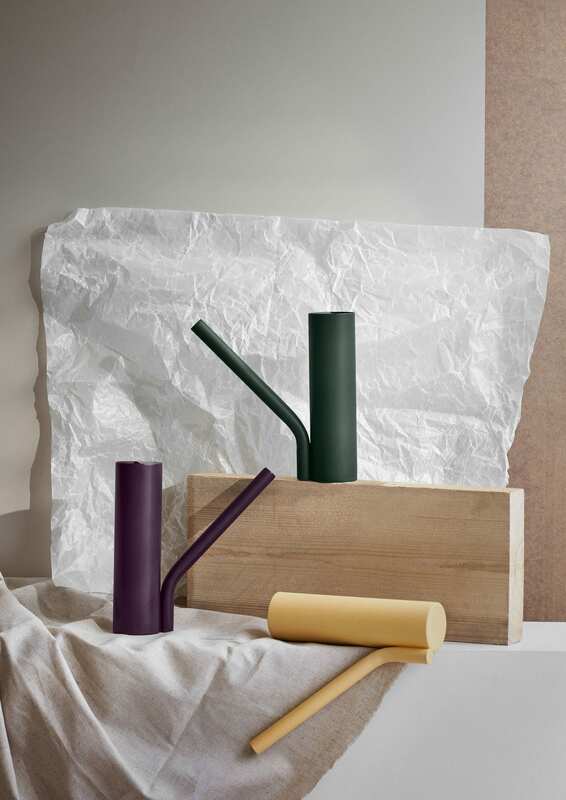 kaschkasch for Blomus // Formally inspired by a streetlamp, the ani lamp by kaschkasch for Blomus playfully invites the user to take it along with them wherever they go. 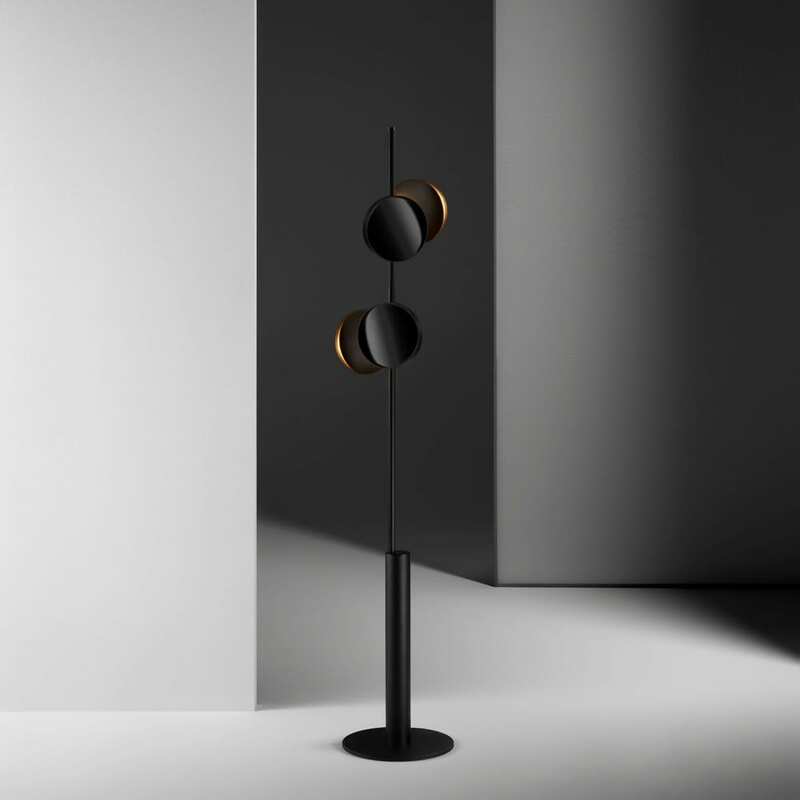 It’s entirely portable courtesy of an integrated battery, and is operated by briefly touching the rings on the lampshade, offering two brightness levels as well as the on/off function. For those that would rather display the lamp more permanently, it can be placed on a stand, hung on a rope, or placed on a table. 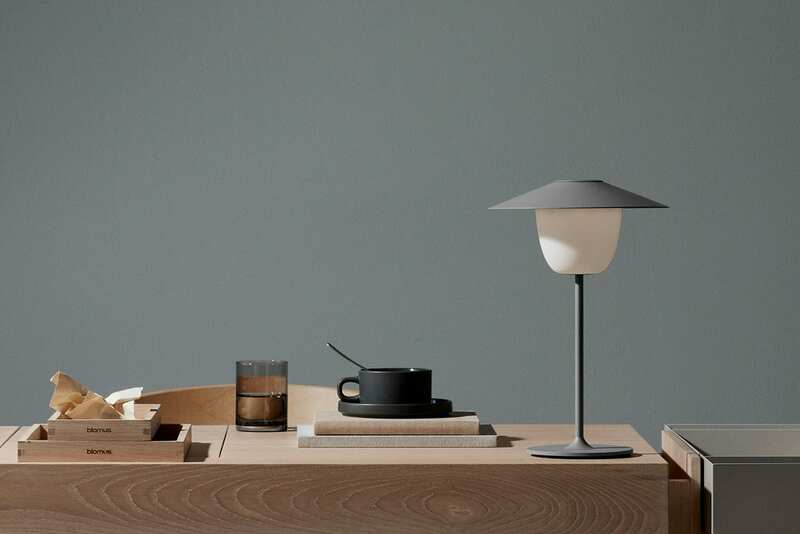 The ani lamp can be recharged on a charging cradle. 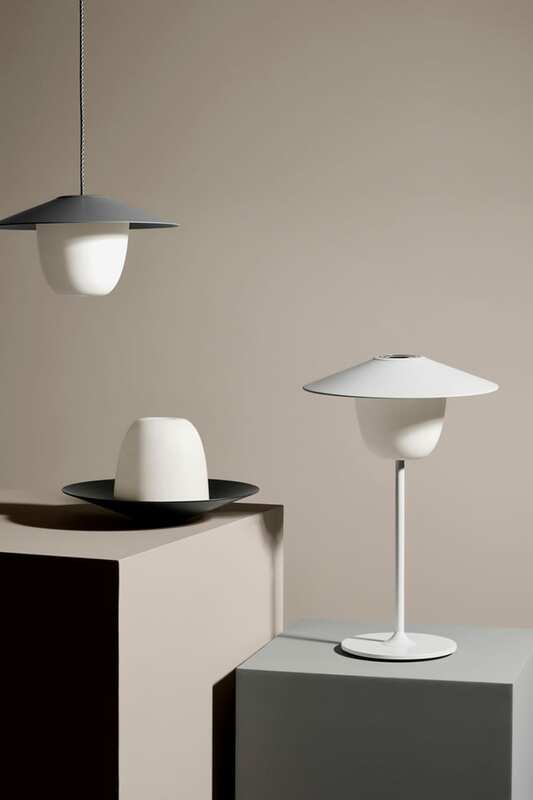 Ferréol Babin for Pulpo // German design house Pulpo have added new lighting designs to their portfolio, collaborating with Ferréol Babin on the “Magma” lamp. 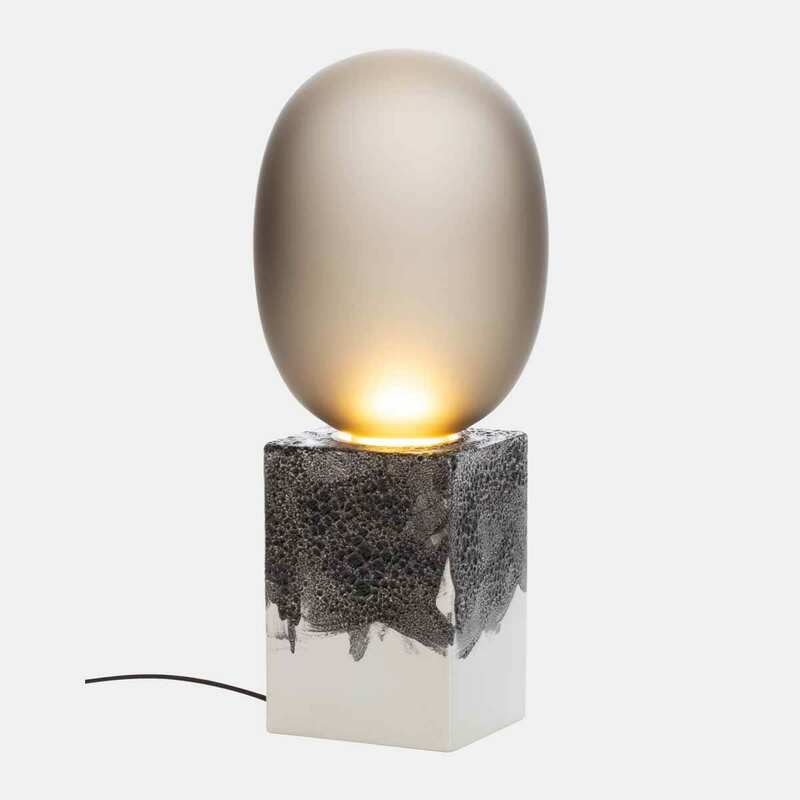 Pulpo’s tendency for innovative materials is proven with their use of a lava-covered ceramic base, which supports the hand-blown glass light. 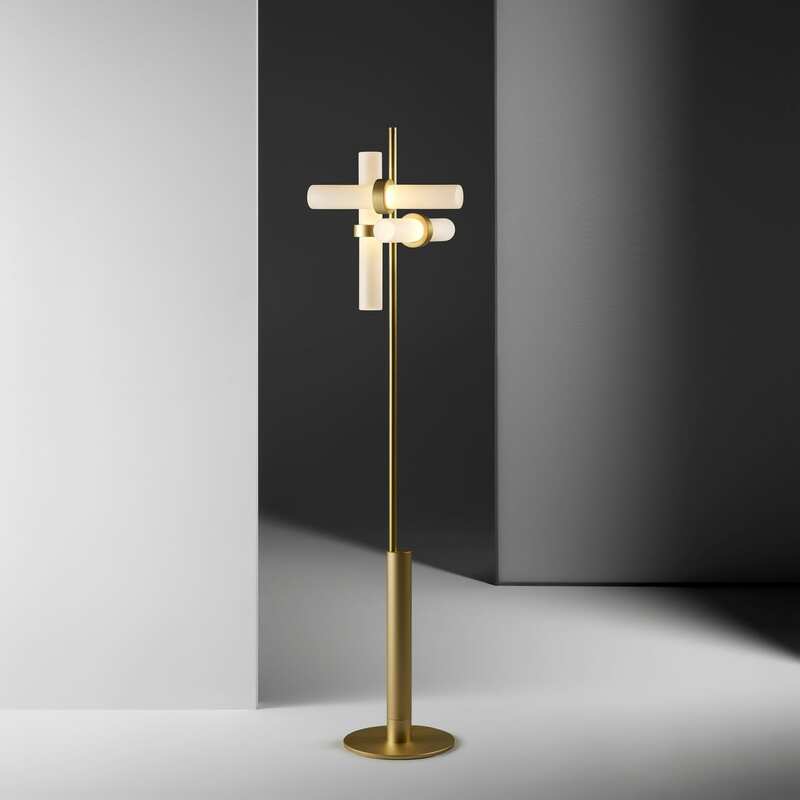 Rakumba X Truly Truly new product release // Melbourne-based brand Rakumba have extended their Typography decorative lighting system by collaborating with Studio Truly Truly on “create-your-own” floor lamps. 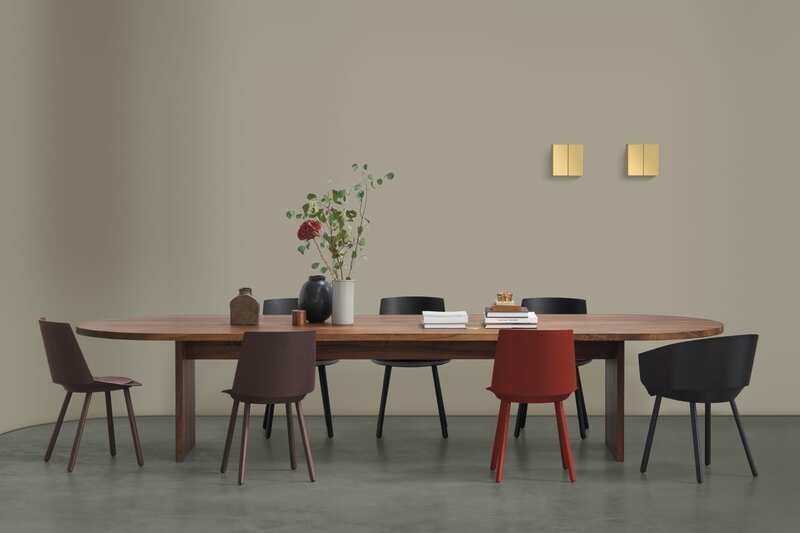 Drawing on the flexibility offered by the Typography Cilon collection, each luminaire can be adjusted and dimmed individually, with a selection of seven lights to mix ‘n’ match as you choose. Don’t panic over making the perfect decision straight off the bat – you can always move the lights to new positions, and add others too. 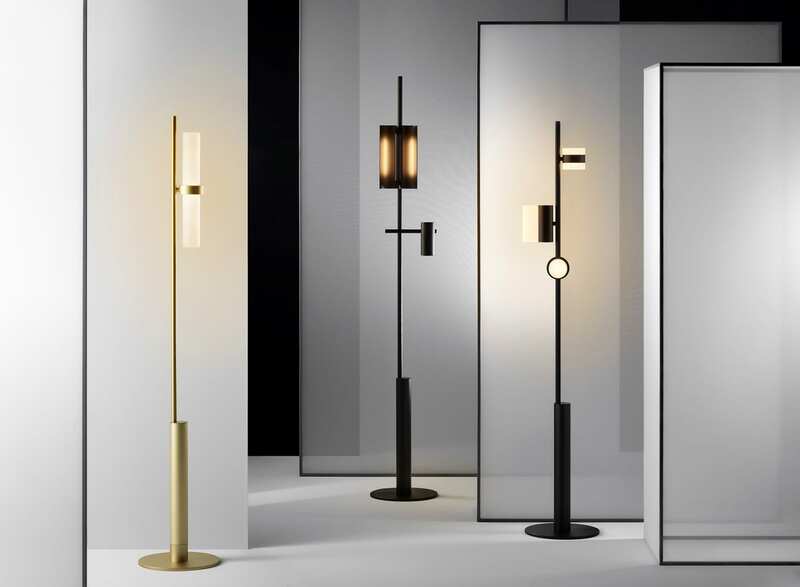 Related: Typography Lighting Collection by Studio Truly Truly for Rakumba Debuts at IMM Cologne 2018. Favius gravity table by Hanne Willmann // Berlin designer Hanne Willmann has created the Gravity coffee table for German furniture brand Favius. 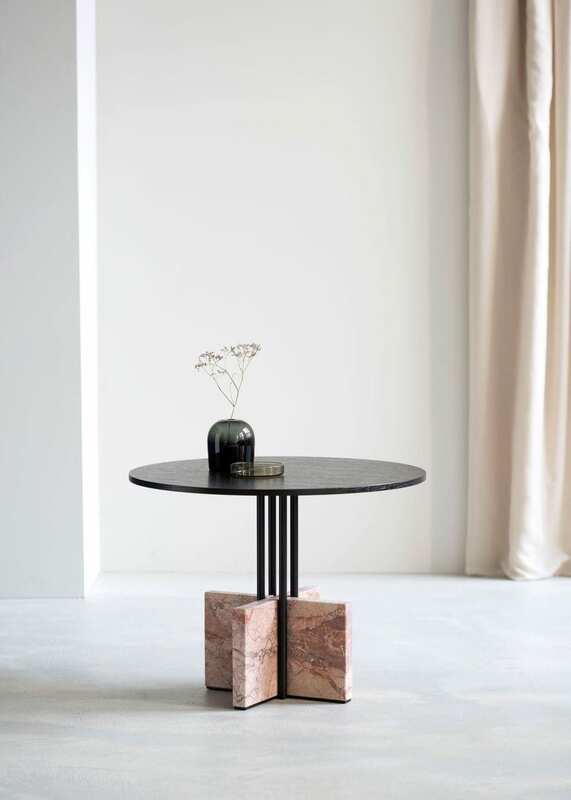 The table comes in two different sizes, featuring a solid marble base that crosses between four matte black steel columns, which elevates a circular plywood tabletop. 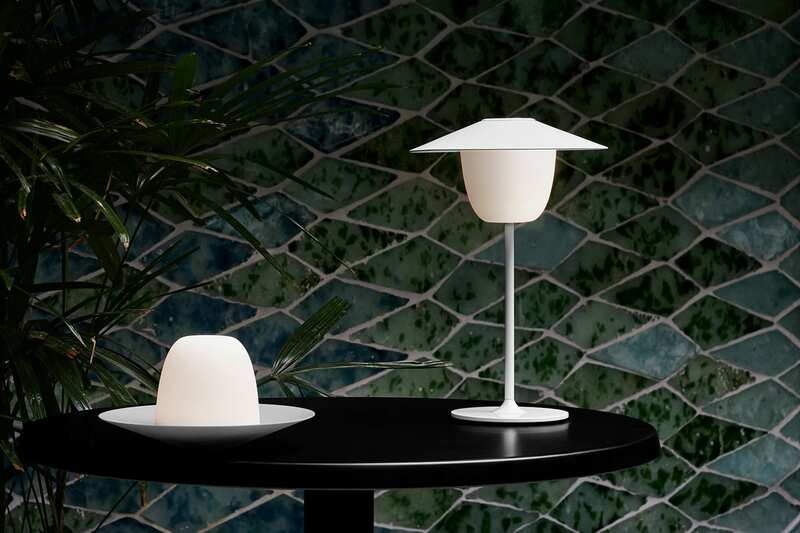 The marble base is available in either dark nero marquina or an earthy pink breccia pernice. 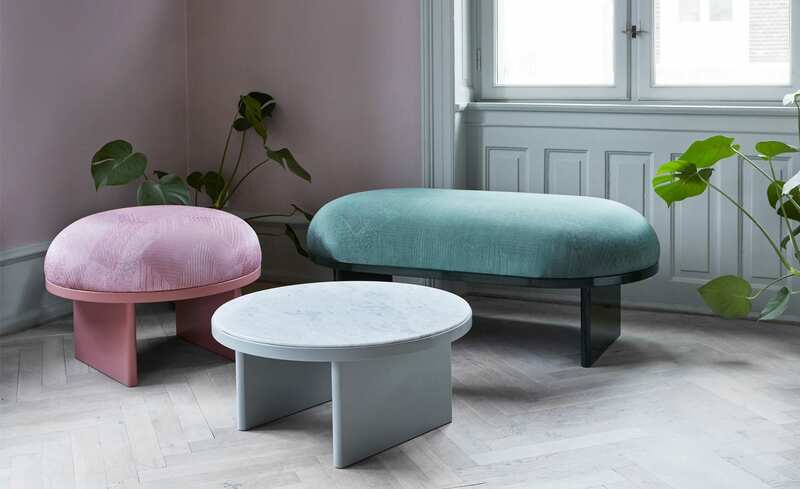 ANZA collection by PLEASE WAIT to be SEATED // ANZA means ‘to sit at ease’ in Japanese, so it makes sense that Danish design company PLEASE WAIT to be SEATED made sure their ANZA collection featured comfy, plush cushions. 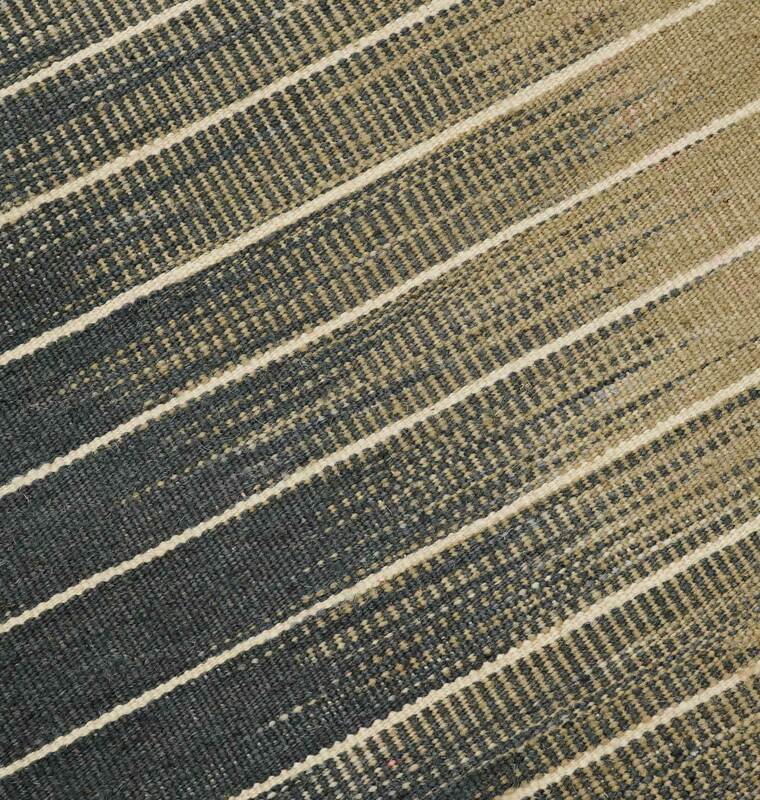 Designers Rui Pereira and Ryosuke Fukusada chose upholstery in traditional 18th Century Japanese textiles, featuring monochrome patchworks and oriental patterns. 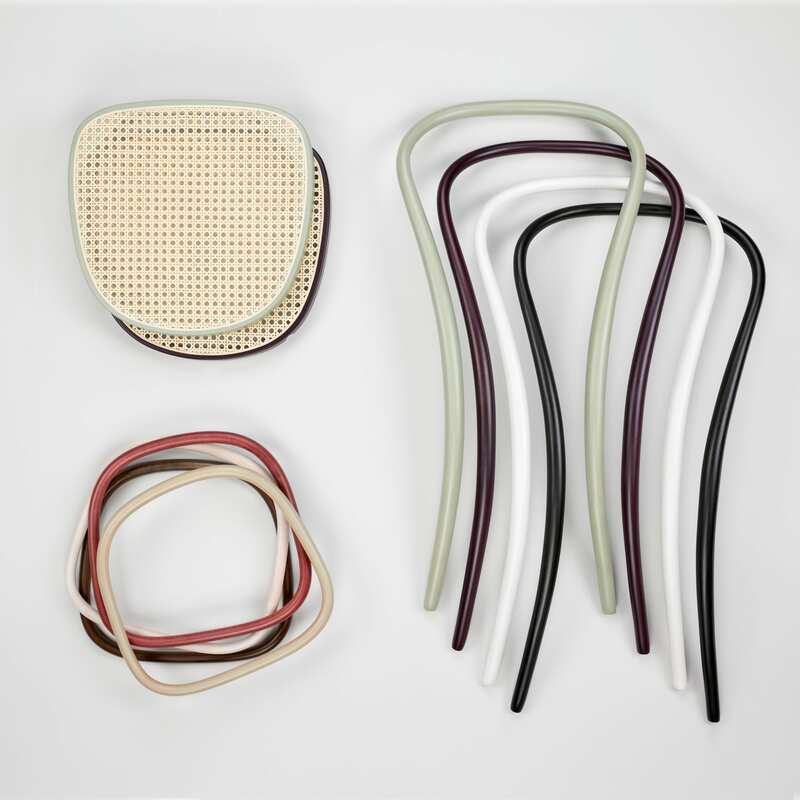 The duo worked with a Kyoto textile producer to match the satin-like fabric to the brands signature colours of cedar green and Indian red. 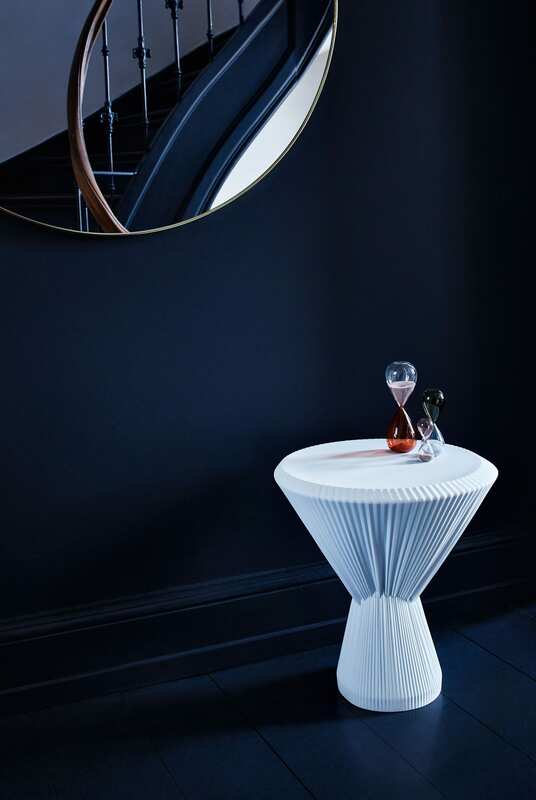 Studio Besau-Marguerre for Porzellanmanufaktur Furstenberg // The PLISAGO side table with its ‘pleated’ structure is made entirely of porcelain, blending design aesthetics with the precision of experienced craftsmanship. Standard Sofa by New Tendency // Under the creative direction of Manuel Goller, Berlin-based studio applies Modernist design principles to their collection of furniture and accessories. Standard Sofa continues the studio’s Bauhaus tradition, featuring clean aesthetics and functional form, handcrafted in Germany. 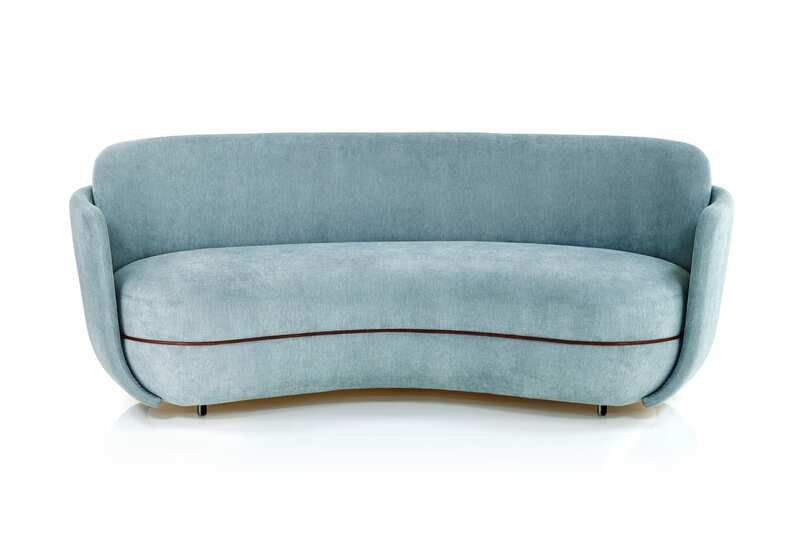 Nilson Sofa by Lievore Altherr. 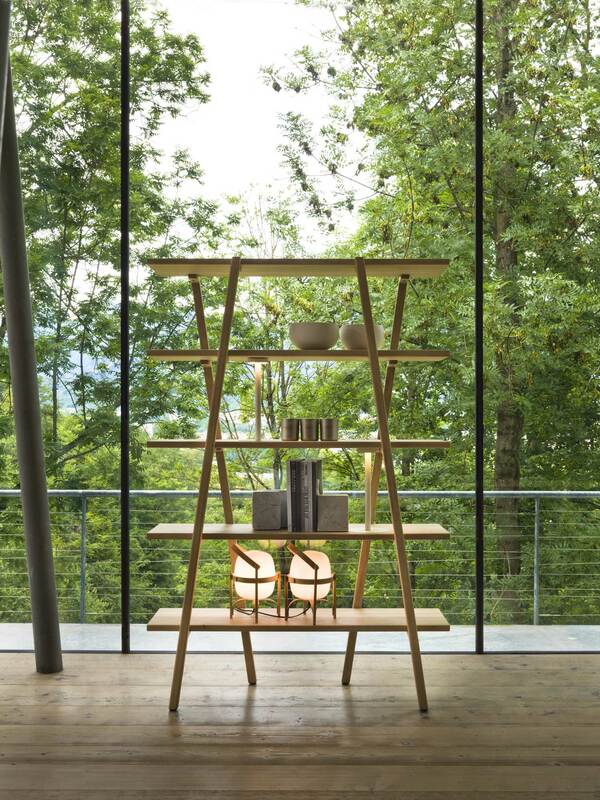 Etan Shelf by Simon Morasi Pipercic. 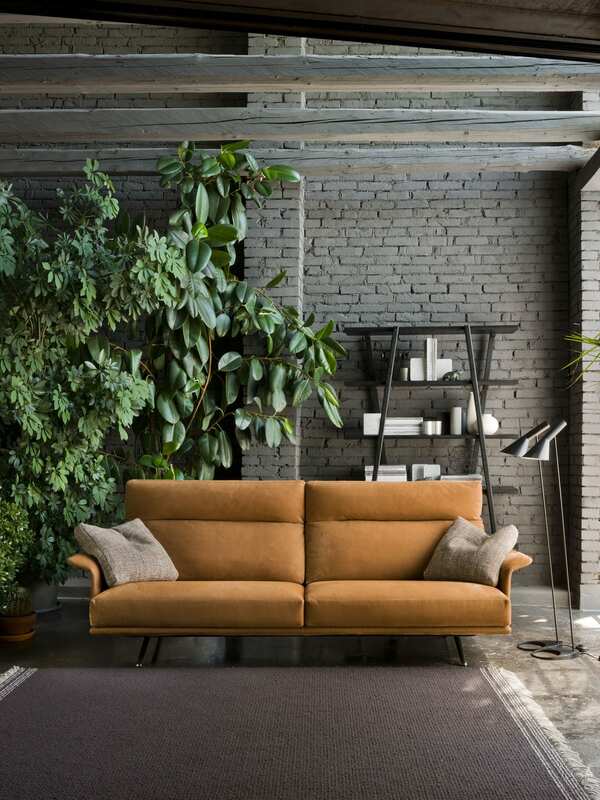 Nilson Sofa and Etan Shelf by Verzelloni // The Nilson sofa by Lievore Altherr is characterized by innovative design and maximum comfort. 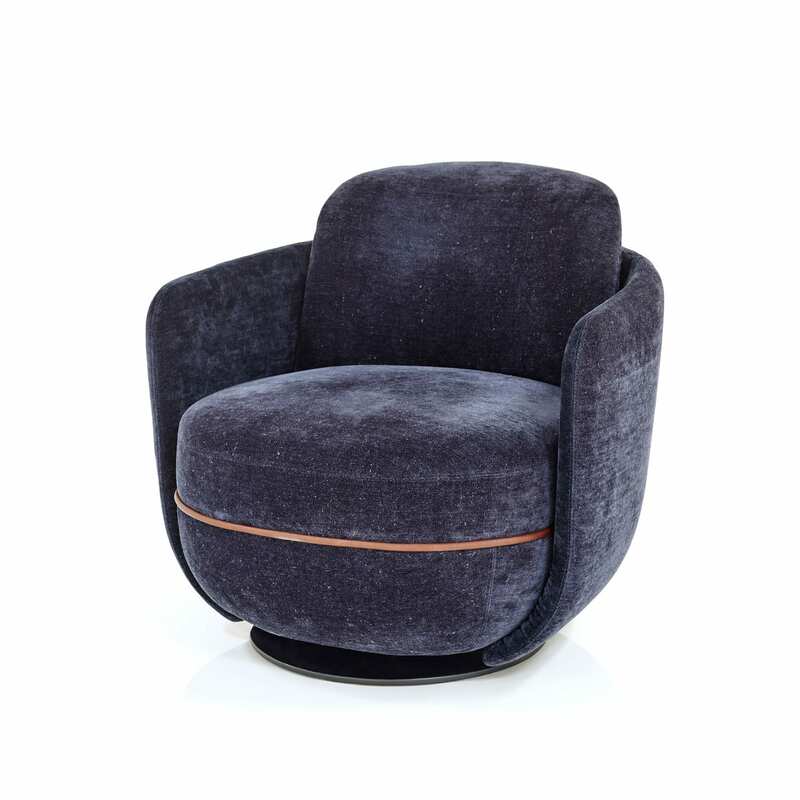 The high backrest version features optional armrest cushions and comes with a reclining headrest. Ergonomic perfection! The Etan Shelf by Simon Morasi Piperčić is striking solid oak bookshelf available in either white oil or black oil, with an open-pore finish. The open design is embellished with bookends in timber or Carrara marble. Piperčić paid close attention to versatility and convenience in his design. 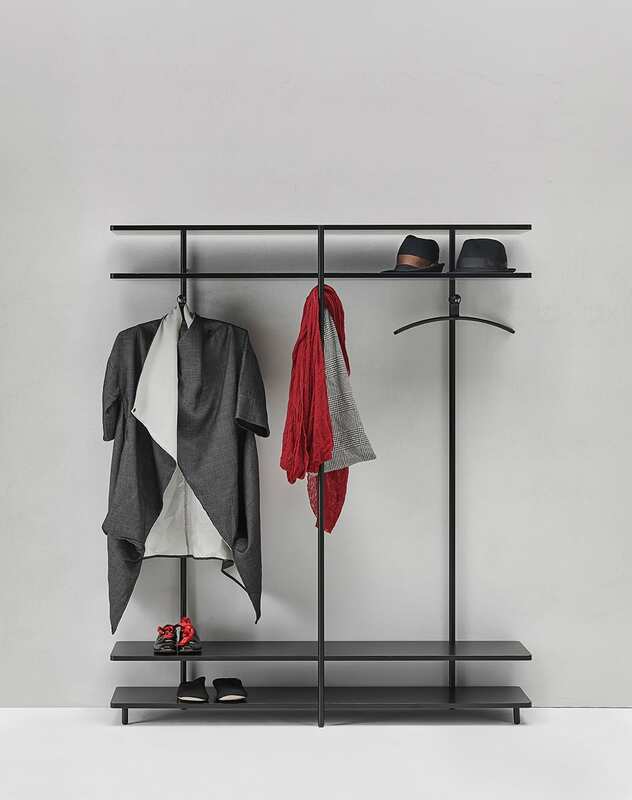 The shelf is easily assembled and comes in two various heights. 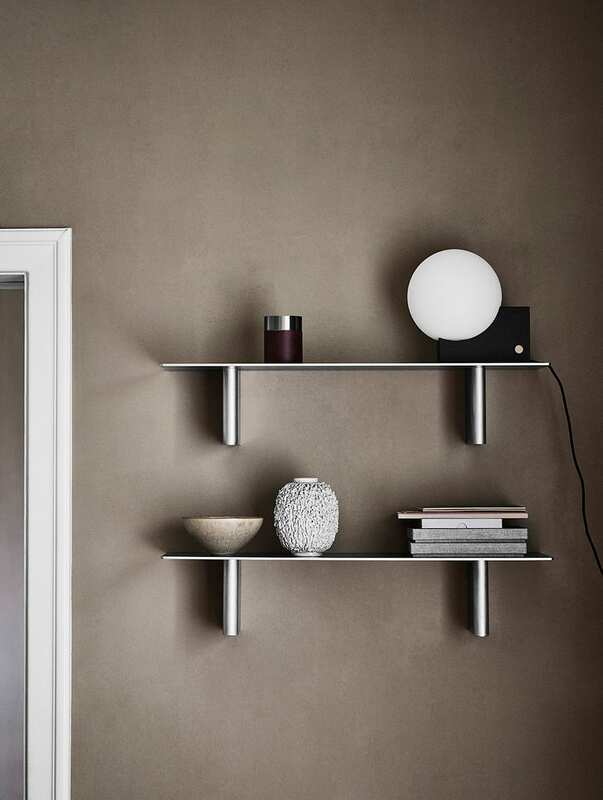 New Products and Updates by ClassiCon // New from Classicon is the Taidgh Shelf Series by Taidgh O’Neill – designed as both the sculpture or shelf, storage surface or a decorative object. 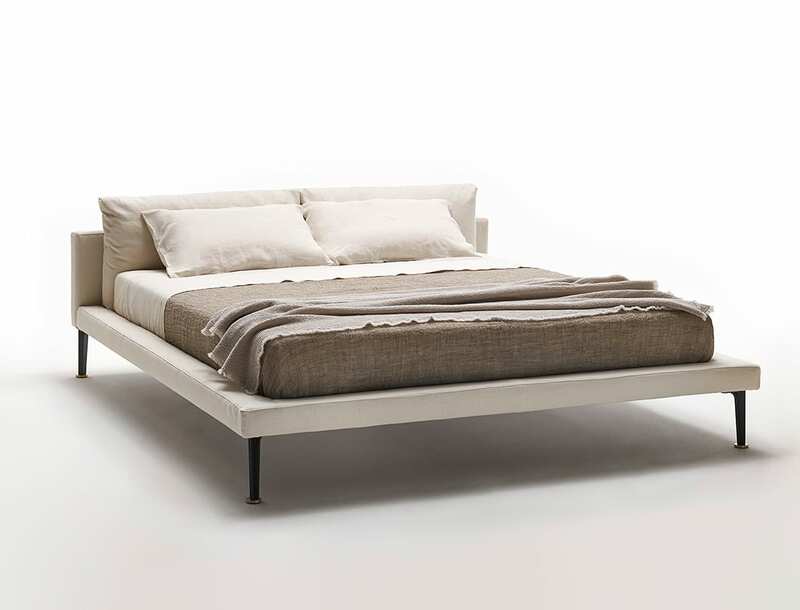 A true design classic from 1925, The Day Bed is counted among Eileen Gray’s most famous designs. 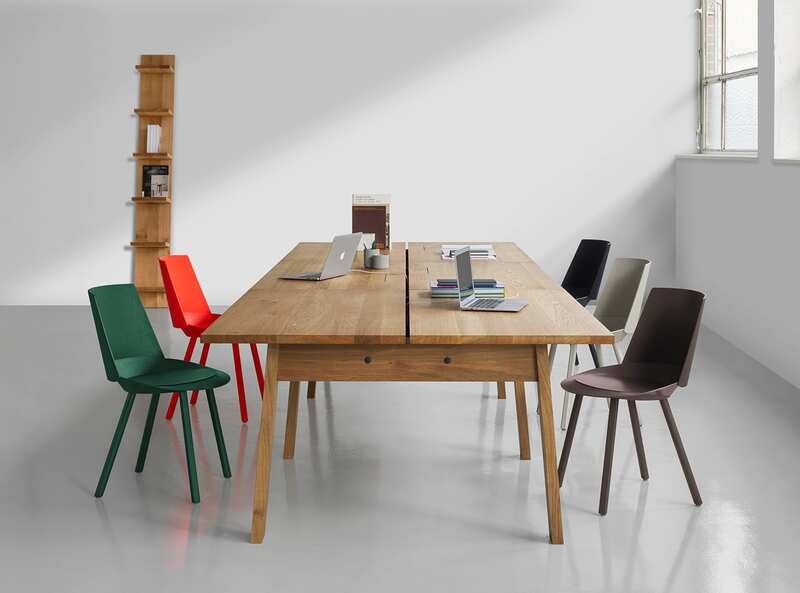 This year, ClassiCon introduces new frame colours and additional sizes of the Modernism icon. 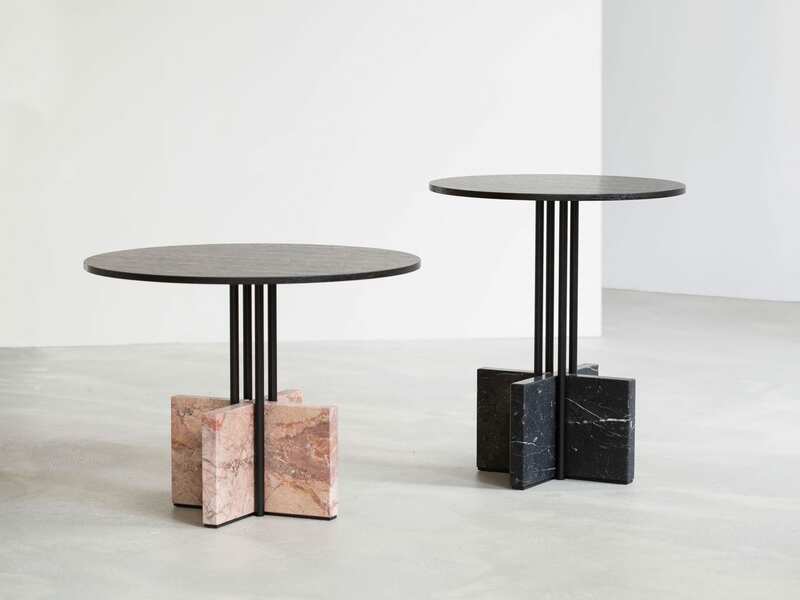 Sebastian Herkner’s Bell Table has also been updated with new versions and marble colours, while Guilherme Torres’s Bow Coffee Table launched last year is now available in a version completely made of white or black marble. Hubba hubba. 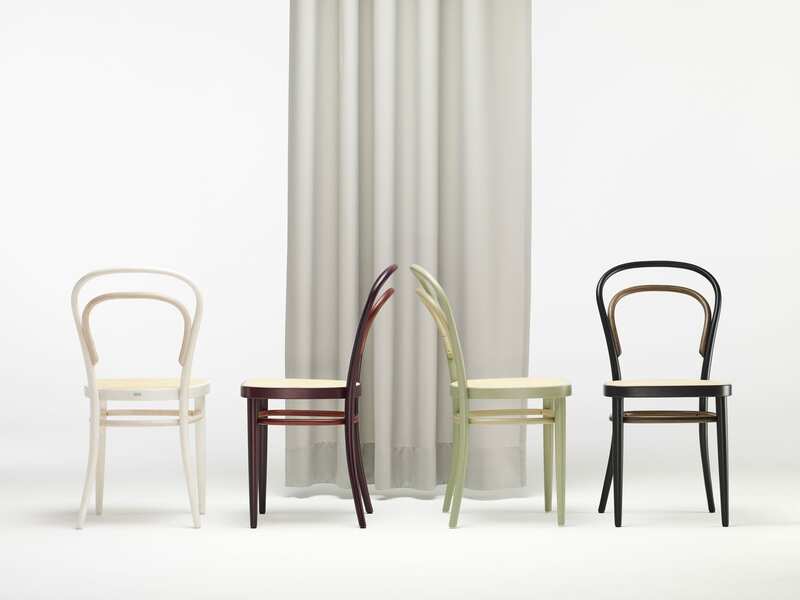 Studio Besau-Marguerre for Thonet // “Café Thonet” was the theme of Studio Besau Marguerre’s 2019 fair booth for Thonet, and in keeping with the theme, the design house displayed the reinterpretation of the iconic Coffee House Chair 214. 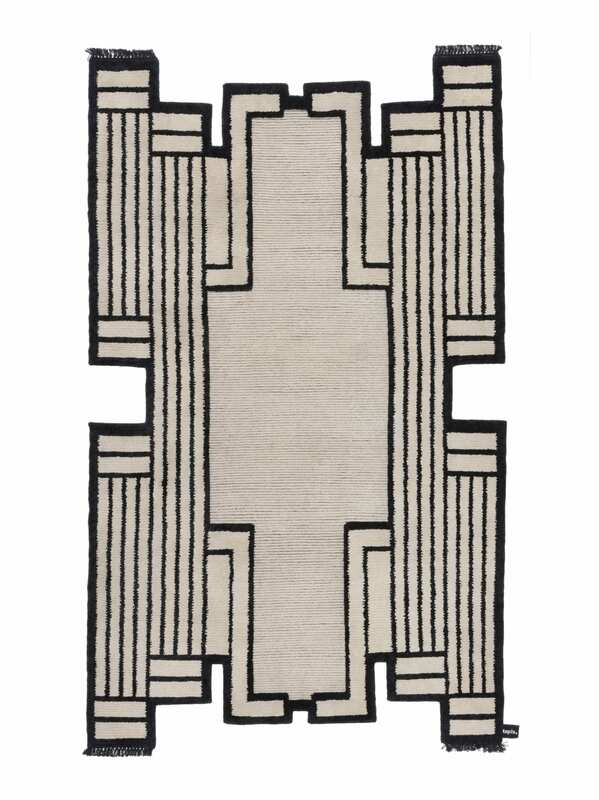 It will be available exclusively in 2019 in four contemporary two-tone colours: black, white, velvet red, and sage. 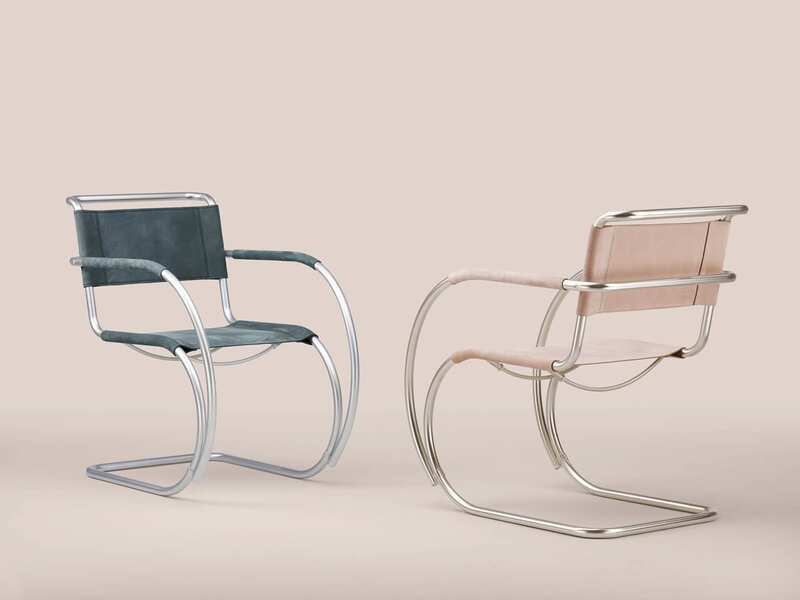 Besau Marguerre also reinterpreted Tonet’s S 533 F chair, a much loved Modernist icon originally designed by Ludwig Mies van der Rohe in 1927. 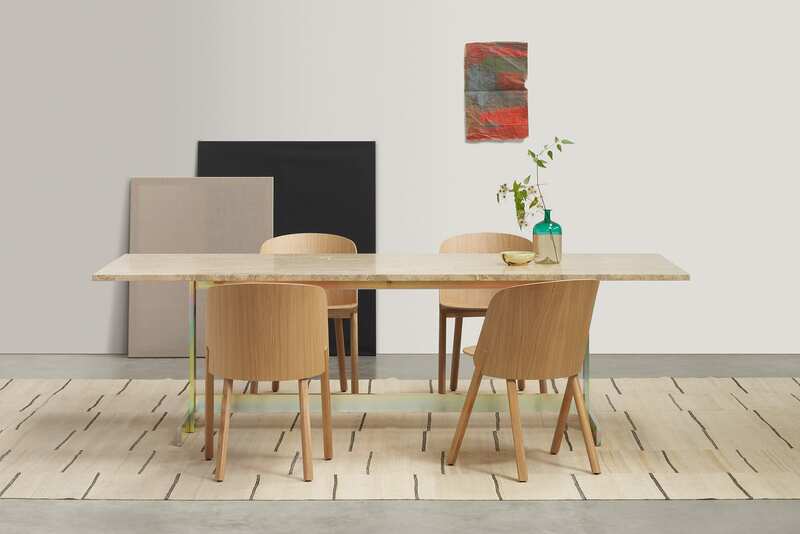 Sebastian Herkner for Zanotta // One of the hardest working and most prolific young designers of our time, Sebastian Herkner, has added the Echino table for Zanotta to his growing portfolio of products and brands. 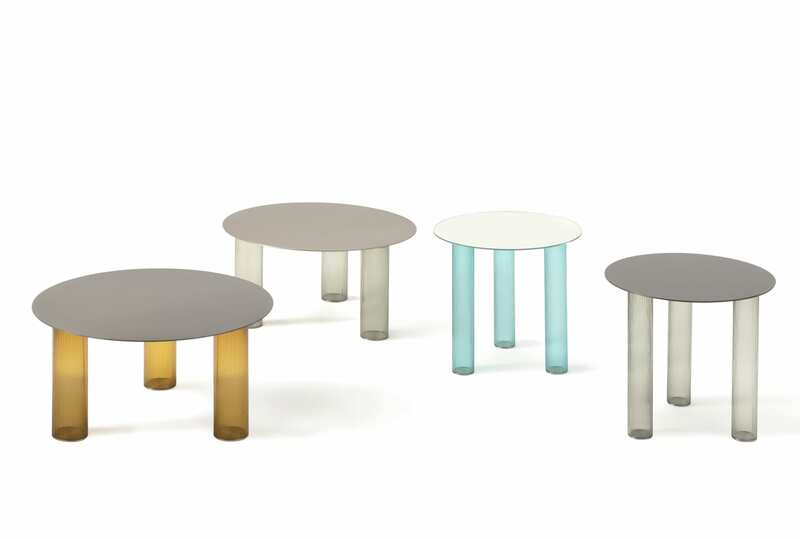 The table is made of three-layered blown glass legs in the shades smoky grey, light- blue, amber or blue with a steel sheet top. Nice. 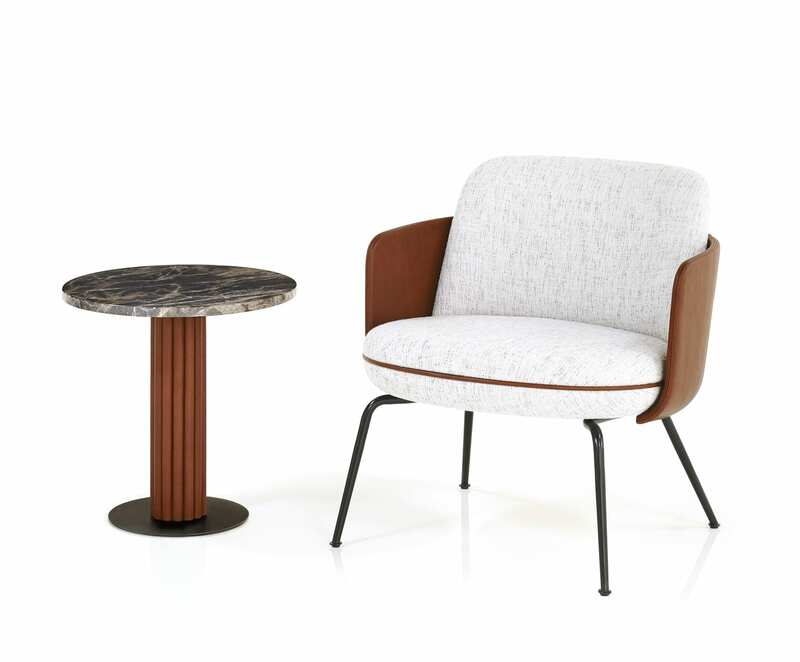 Merwyn Lounge Chair & Miles Side Table. Sebastian Herkner for Wittmann // Speaking of Sebastian Herkner, the German designer has updated his Merwyn seating collection for Wittmann, as well as the Miles collection which now includes side tables in addition to armchairs and curvalicious sofas in various sizes. Material collage by Farah Ebrahimi. 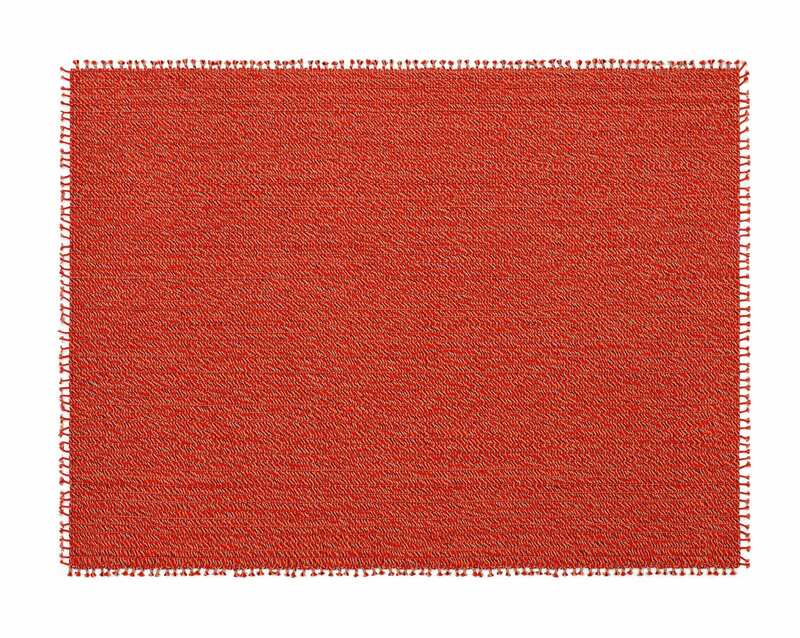 New releases by e15 // e15 expanded several pieces for their existing collection. 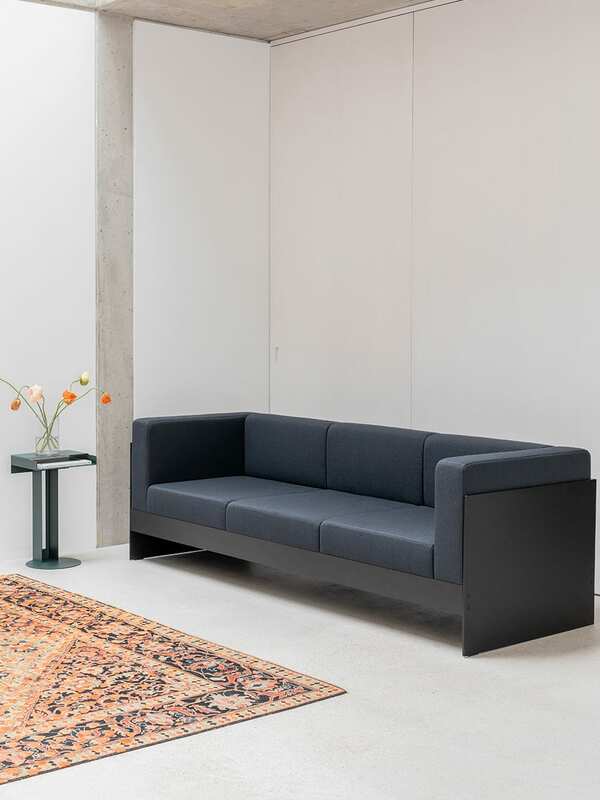 Amongst those is their collaboration with David Chipperfield with Basis, which is now available as a workstation – the sexiest one we’ve seen around here in a while, we might add. 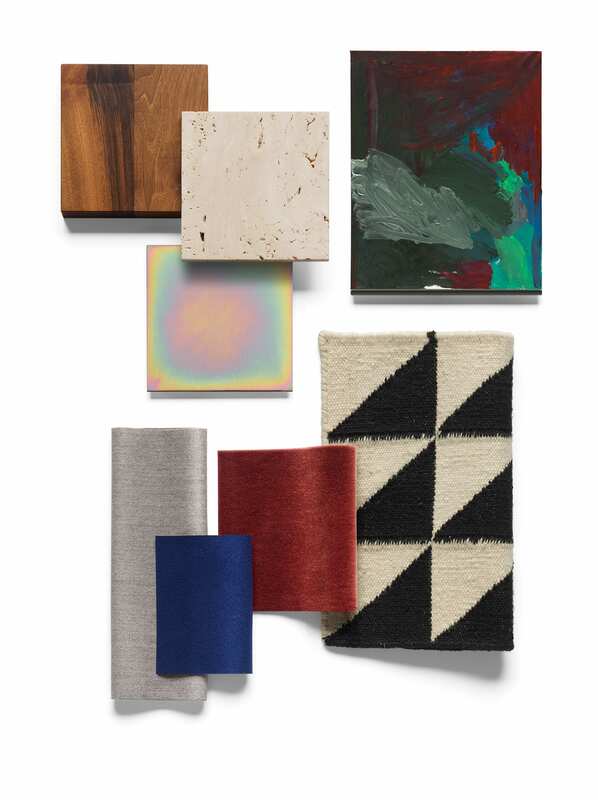 The German brand also celebrates the 100th anniversary of Bauhaus with material collages created by Farah Ebrahimi, mixing light and dark tones inspired by nature such as Lapis blue, Carnelian, Turquoise, and Ochre in refreshing combinations. Rios Patio Textile by Karina Nielsen. 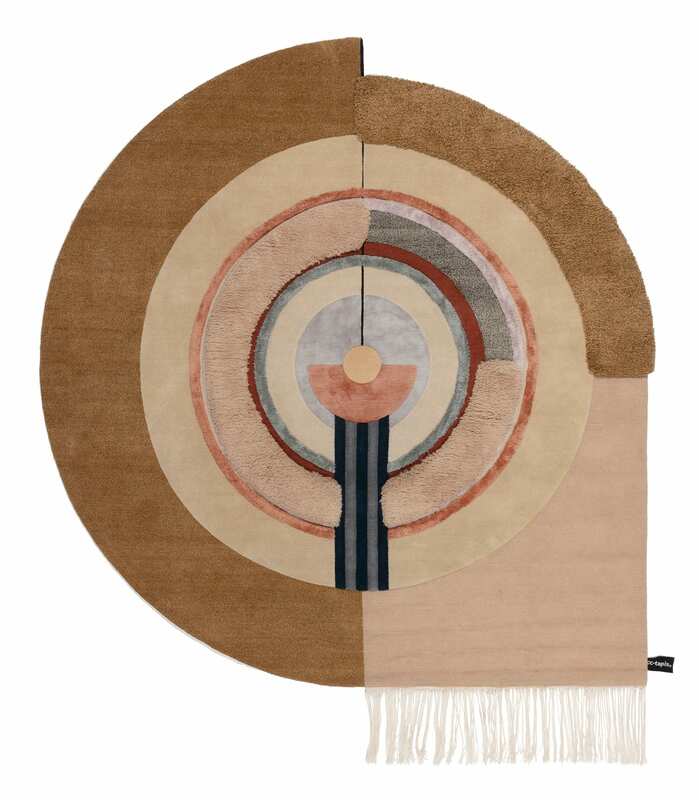 Sinuous Rug by Simone Post. 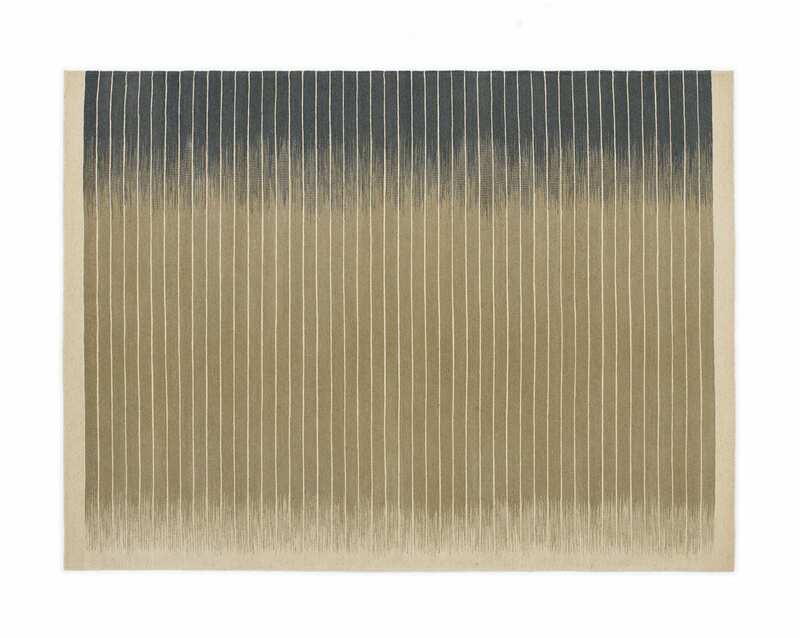 Slope Rug by Hella Jongerius. 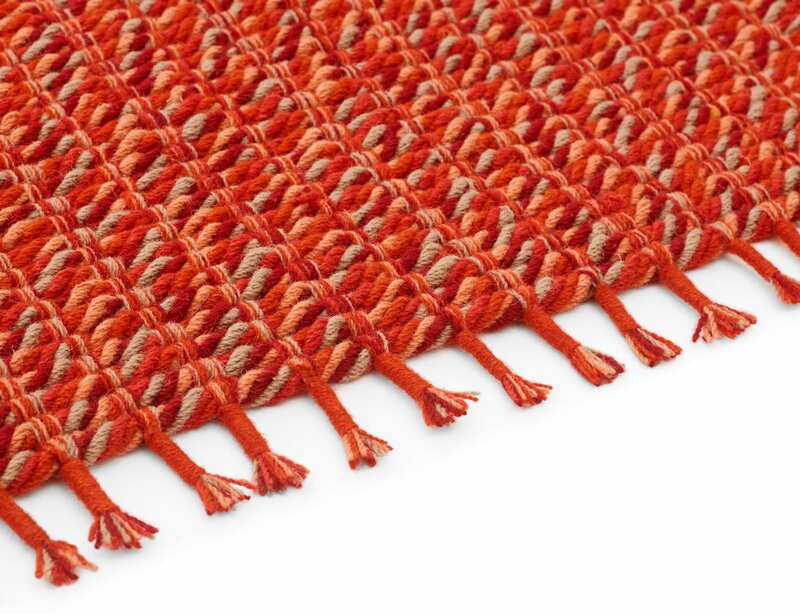 New rugs and textiles by Kvadrat // Kvadrat latest designs reflect deep-rooted respect for nature, demonstrating innovative sustainable materials and process. 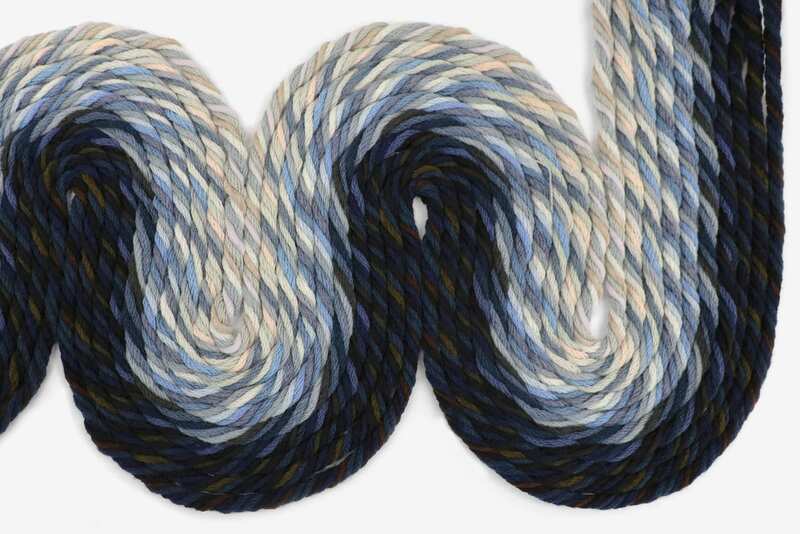 Standouts include Sinuous by Simone Post, based on how certain colours create a visual ‘vibration’ when next to each other. 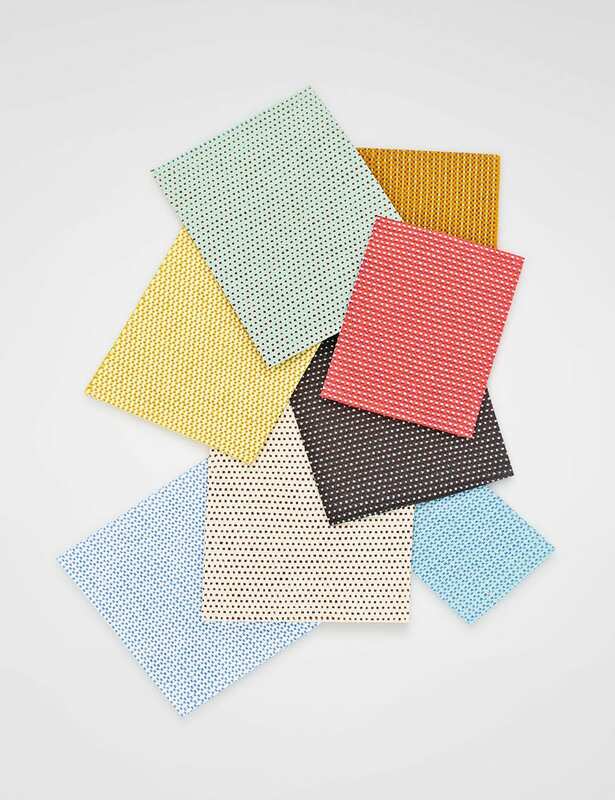 Patio by Karina Nielson is a textile developed exclusively for outdoors, featuring a fluorocarbon-free, environmentally focused finish, which is water-repellant and fast drying. 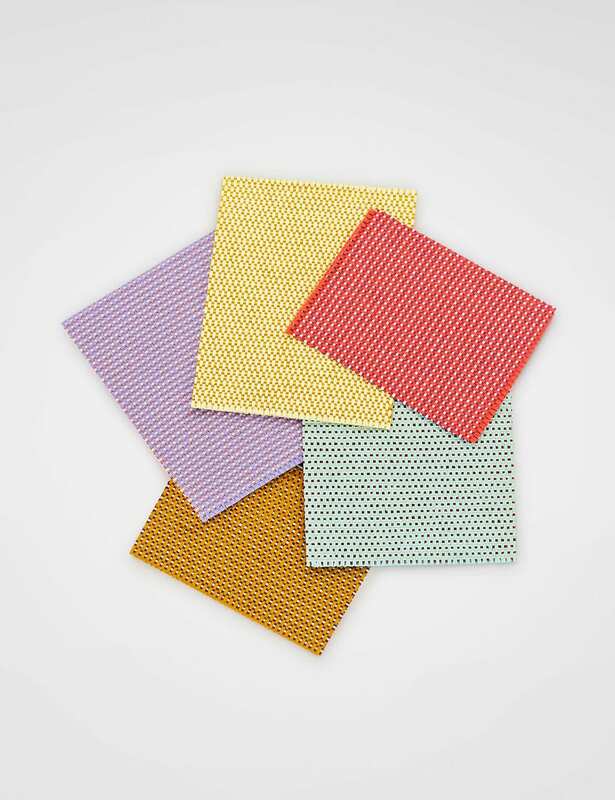 The vibrant material took three years to perfect. Ultimate Bliss by Mae Engelgeer. 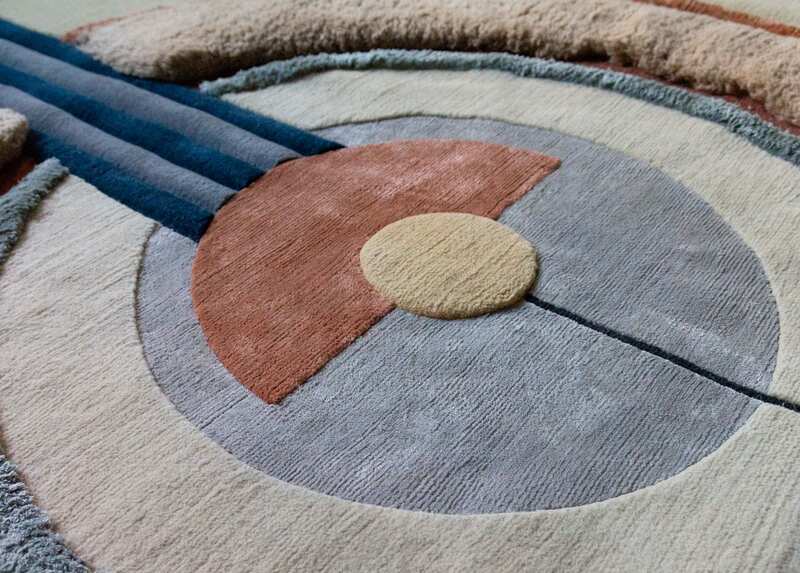 New rugs by cc-tapis // cc-tapis exhibited a selection of diverse designs by Patricia Urquiola, Bethan Laura Wood, and Mae Engelgeer. The latest addition to the catalogue, Asmara by Federico Pepe, was also on display. Its namesake, the Eritrean capital, inspired the simple shapes and bold, graphic design. 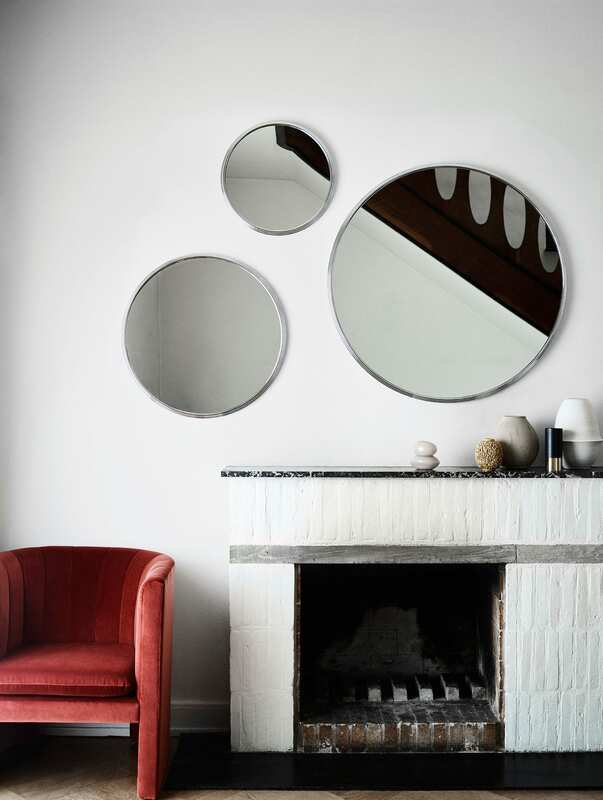 Sillon Mirrors by Sebastian Herkner. 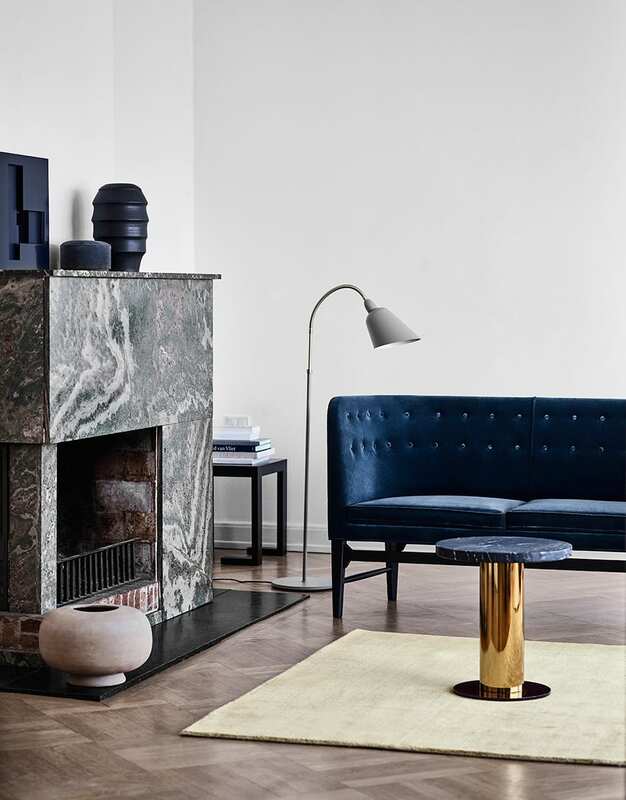 New pieces by & Tradition // The Danish brand has expanded their collection with several new pieces. 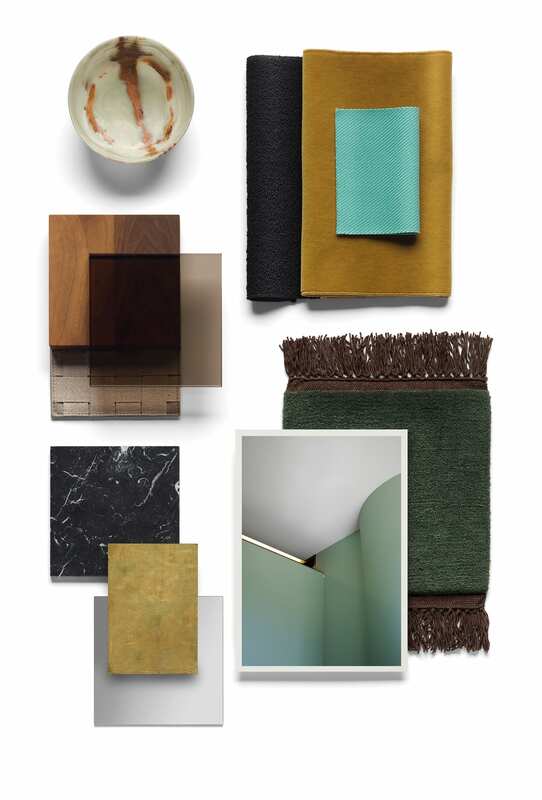 The ones that caught our eye include the In between table, Column shelves and Sillon Mirrors by Sebastian Herkner. 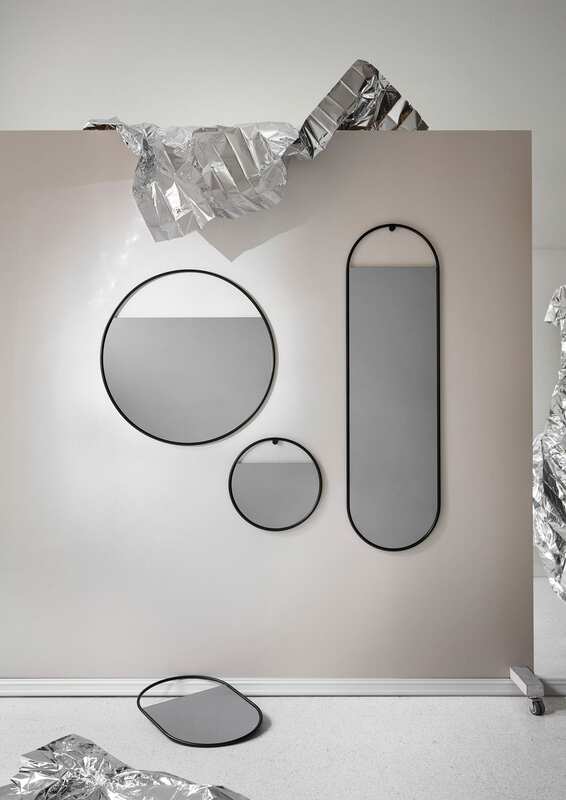 Peek Wall Mirror by Elina Ulvio. Ink wall lamp by Felix Isidorsson. 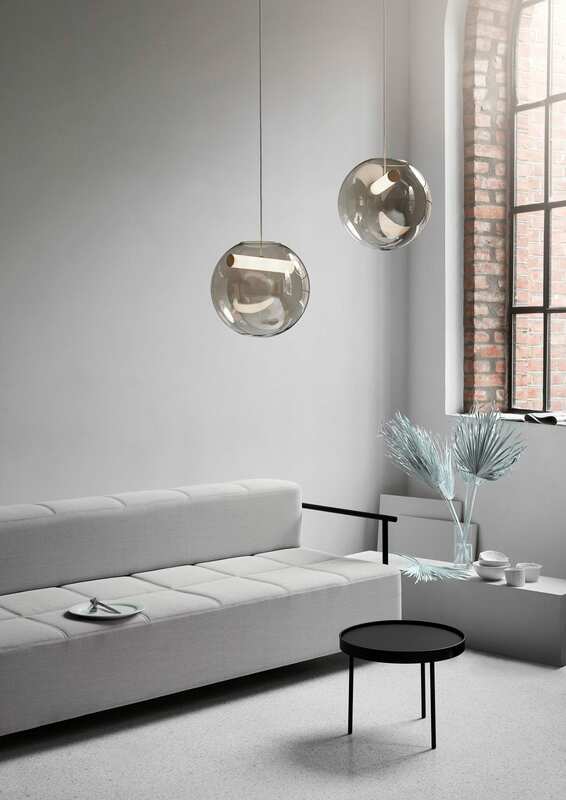 Reveal Pendant Lamp by Silje Nesdal. Grab Watering Can by Stine Aas-Northern. 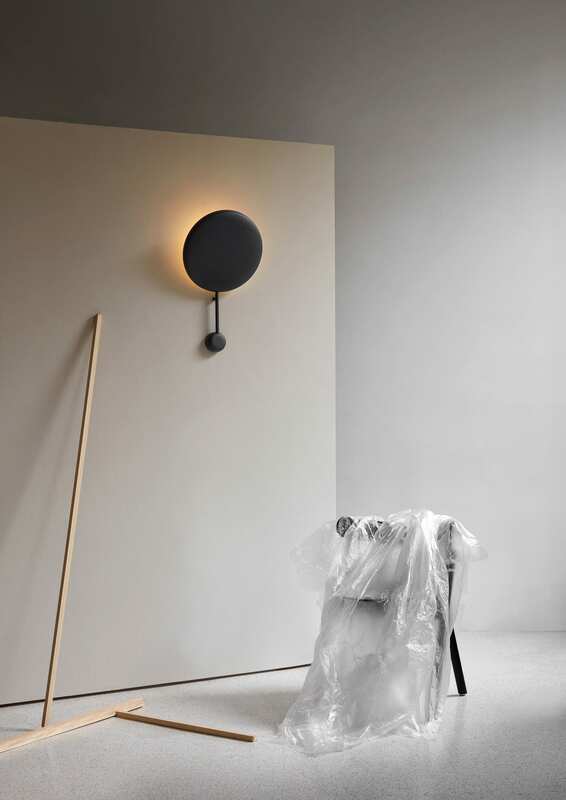 New pieces by Northern // New and updated pieces joining Northern collection include Peek wall mirror by Elina Ulvio, Ink wall lamp by Felix Isidorsson, Reveal pendant lamp by Silje Nesdal and cute-as-a-button Grab watering can by Stine Aas-Northern. 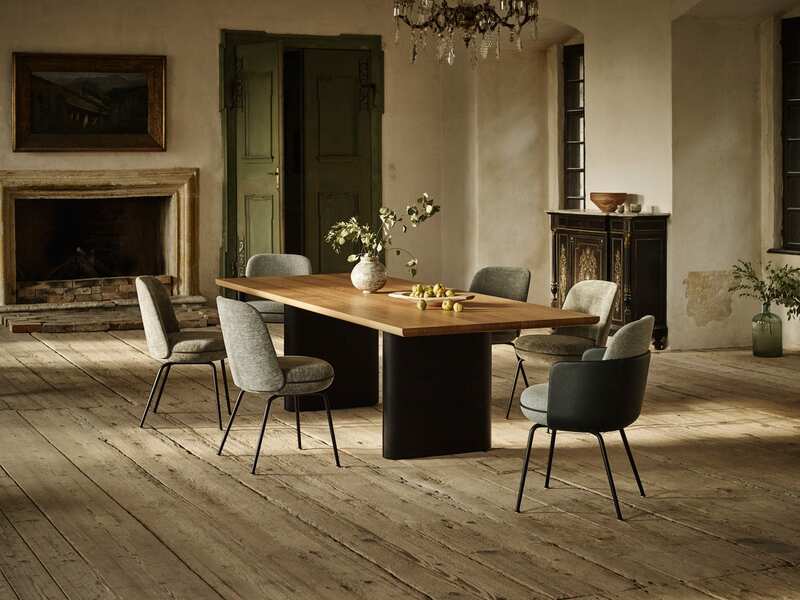 New pieces by Living Divani // 2019 marks the 50th anniversary for the family-owned company, of which 30 years have been spent in collaboration with Piero Lissoni. At IMM, the Italian brand previewed the new Aero V valet stand by Shibuleru, and Floyd Bed by Mr Lissoni. The post Best in Show: IMM Cologne 2019. appeared first on Yellowtrace.